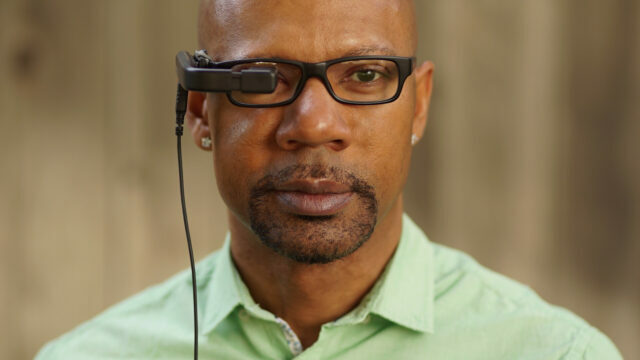 The Vufine+ is a wearable device that sends a 720p image from your HDMI-equipped camera to your sunglasses. Sounds great, but how does it hold up in the field and, more importantly, does it really work? Let’s find out. The Vufine+ Wearable Display is the result of a successful Kickstarter campaign, and there is much to like in the design. 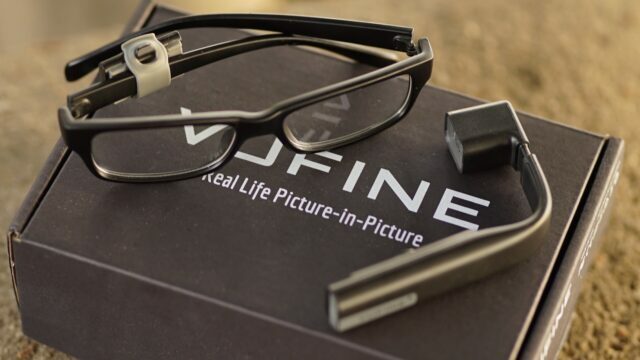 For one, the Vufine+ connects to a magnetic docking unit that is compatible with the supplied non-prescription glasses as well as all the different brands of glasses I have in my house. 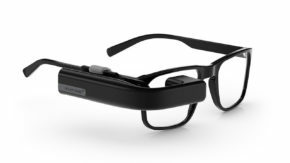 Simply snap the magnetic docking unit in place on the right side of your favorite pair of glasses and you are in business. 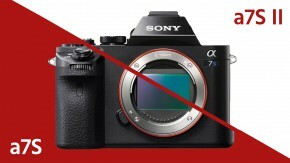 For this review I used my trusty Sony a7s and connected a thin 3ft HDMI cable from the camera directly into the Vufine+. The image popped right up into the wearable display without any menu tinkering. I expected the ergonomics of having to connect a cable to my glasses to be cumbersome, but I was surprised to find the connected cable wasn’t annoying at all, although I imagine a heavier or cheaper cable would not be the way to go with this setup. My movement didn’t feel inhibited and after shooting handheld for several minutes I even forgot I was tethered. While wireless is clearly the future for this technology, having to work wired is not an insurmountable barrier. The 720p image displayed for my right eye provided enough resolution that I was able to easily judge focus with my left eye closed, and the display itself was large enough that I wasn’t distracted by the environment around the image. You’ll want to de-clutter your camera image as much as possible by removing elements like waveform and audio levels. Reading settings with the display was just not as easy as judging framing or focus for me. Charging the display through a USB cable and your favorite USB dock is simple. For me, the power lasted almost exactly the advertised 90 minute runtime after a full charge. You can also charge the device through an external battery brick, but having both a power and an HDMI cable connected to the glasses at the same time was a bit cumbersome when I tried it. I found needing to close my left eye to judge the image to be the biggest use hurdle for me – that part just doesn’t feel comfortable. Somehow, having to spend hours on set with my face buried into a comfy EVF chamois just feels better than shooting with the Vufine+ mounted on my glasses. 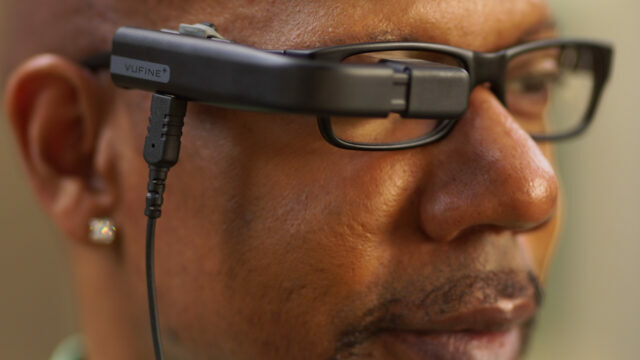 That being said, I can’t help but feel this type of wearable technology is very much the future for DPs and Cam Ops. It’s worth mentioning that the airspace industry is already deep into wearables, with eye-tracking technology being employed in fighter pilots’ helmets. Might eye tracking technology slowly make its way into the camera industry? Yes, please. 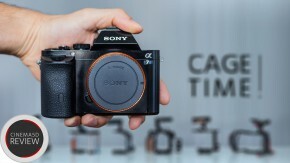 Do you think wearable tech is poised to change the camera industry for the better? Comment below! Thanks for the review. I’ve a few questions. Would an eye patch make sense for the right eye? How good is it for critical focus? 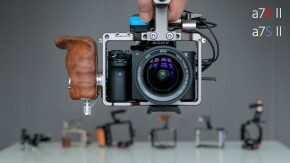 Is it viable for gimbal use? How is it for judging exposure? Would using a wireless receiver rigged to a belt with an NP batt work to go wireless?